Ideally, sprayers should be cleaned at the end of each day (even if the same pesticide will be sprayed the next day) and definitely before switching products. 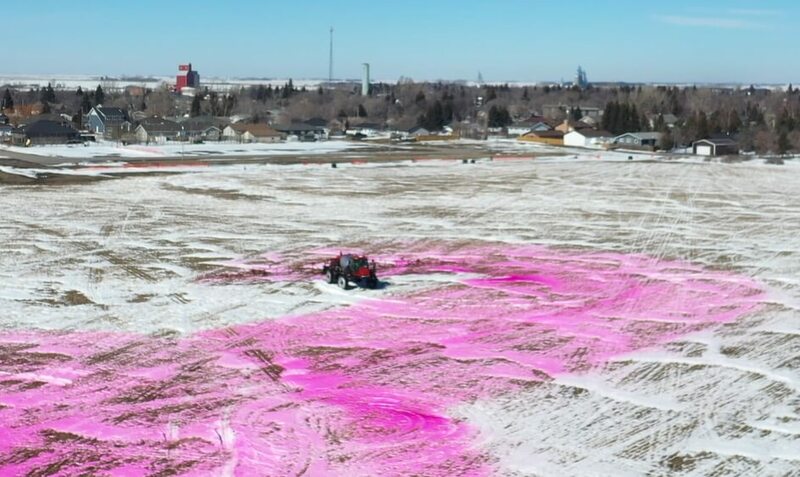 Next to sprayer math, this is one of the more distasteful parts of spraying for many operators, so it’s not performed as often or as thoroughly as it should be. Residue on and in the equipment can damage sprayer components, may be incompatible with other products, and leads to unnecessary operator exposure. Before cleaning a sprayer, read the sprayer operator’s manual and consult the pesticide label for any special instructions. Cleaning a sprayer is a lot like doing the dishes: Using the right detergent, soaking the hard stuff, being thorough, and rinsing properly – they all matter. 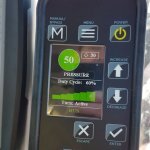 If you’re efficient, and accept that this process is part of the spray day, sprayer cleaning doesn’t have to be unpleasant or time-consuming. Experience, and some math, is helpful to make sure the last tank empties nicely at the end of the last row. Some operators have been known to speed up or slow down to accomplish this… not recommended, but sometimes unavoidable. Even when the tank appears empty, sprayers can retain several litres of spray solution in the sump and lines. Rinsing the system multiple times with low volumes has proven more effective at reducing pesticide residue concentration than a single, high-volume rinse. A wooden sprayer tank. You know that had to be tough to clean thoroughly. The effectiveness of the triple-rinse was reaffirmed in 2014 when Colorado State University conducted a state-wide survey of field sprayer clean-out practices. 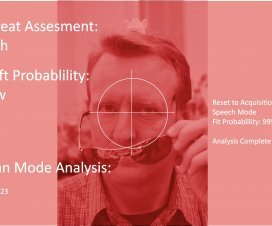 No, not airblast, but the principle is the same. More than 50 respondents provided samples of their clean water source, their pesticide tank solution, and samples of rinsate from each sprayer rinse in their typical cleaning process. Surprisingly, some of the lowest levels of pesticide residue came from triple-rinsed sprayers using only water. 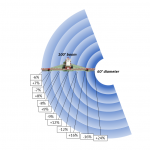 When the Colorado researchers enquired further, they discovered that these operators never let product sit in the tank for prolonged periods. They were diligent about cleaning at the end of every spray day; never leave product in the tank overnight. 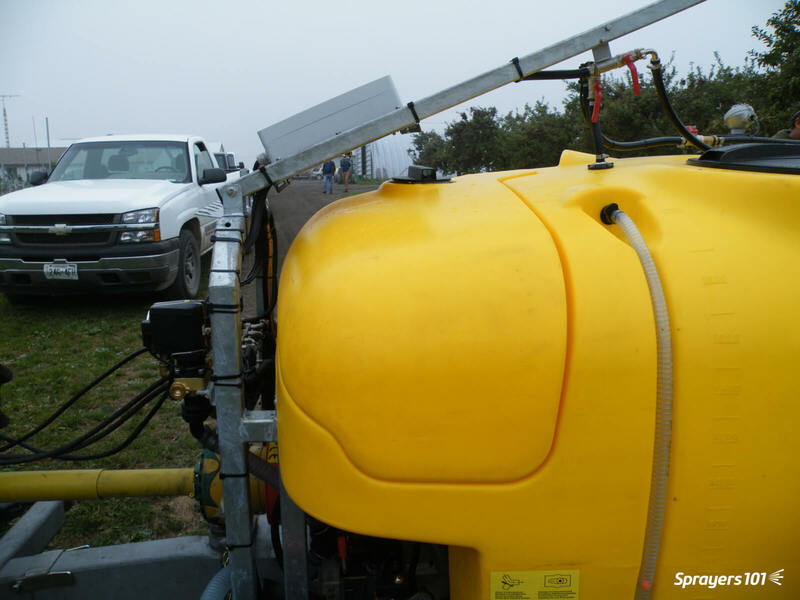 Once the sprayer is “empty”, use clean water to fill the tank to 10% of its capacity (or add 10 parts water to one part spray solution remaining in the tank and lines). Agitate and circulate it through the entire sprayer for five to 10 minutes. Open and close any lines or valves during this process to ensure everything is exposed to the rinse. 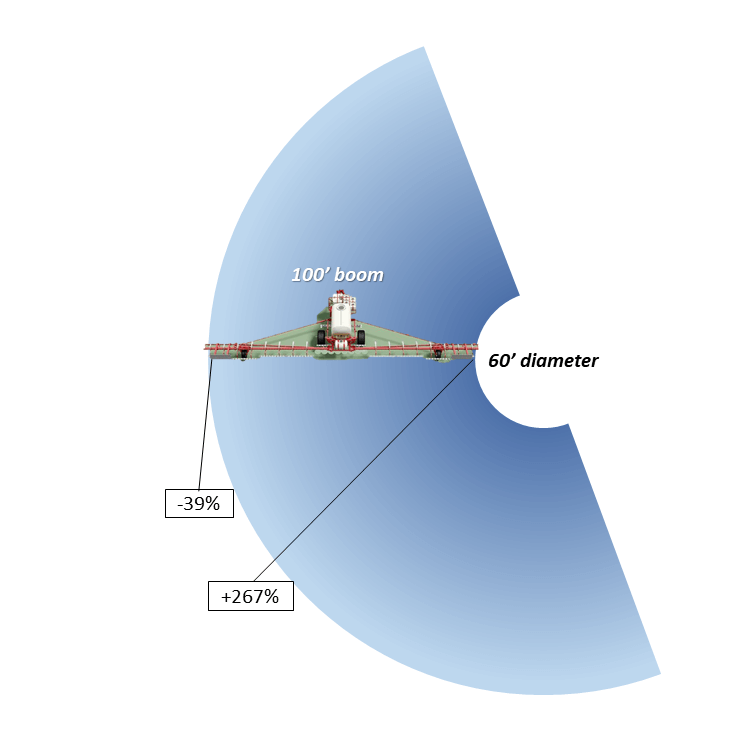 The use of such low volumes may not be possible with centrifugal systems where the tank must be filled above the top of the pump for priming. 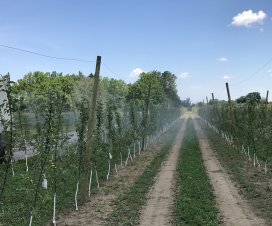 Further, low-volume rinsing may not be suitable for certain pesticides; if methods conflict, always follow pesticide label guidelines for cleaning instructions. The clean water for this process is usually carried in a separate tank on the sprayer or on a support vehicle. While still rare in Ontario, low-volume, automatic tank rinse systems are available on newer airblast sprayers. They generally consist of a small supply tank mounted above the pump to supply clean water to rinse nozzles inside the tank. The number and orientation of the tank rinse nozzles should provide enough water to contact all surfaces inside the tank. 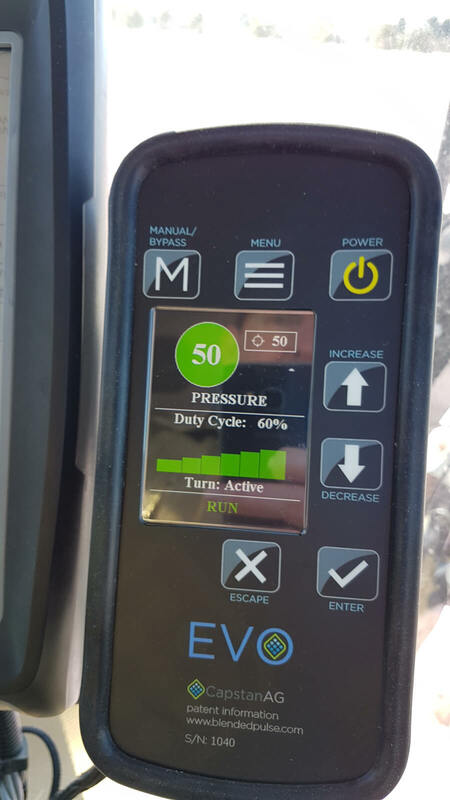 These systems reduce operator exposure, save time, and should be used regularly to prevent seizing. 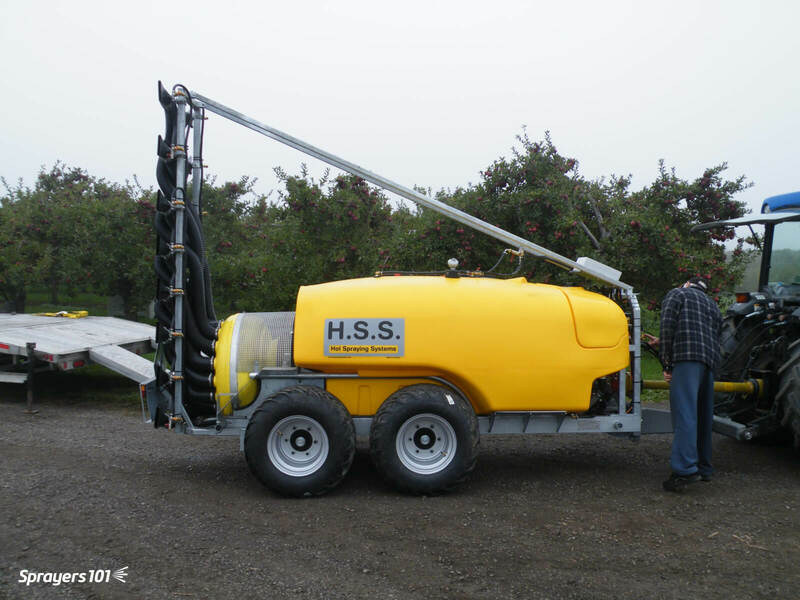 This Hol sprayer is a Holland import and is relatively new to Ontario. The Hol features a separate 150 L tank to supply clean water to its automatic tank rinse system. Perform the triple rinse in the planting that was just sprayed. The dilute rinsate can now be flushed through the lines and sprayed out through the nozzles onto the crop. 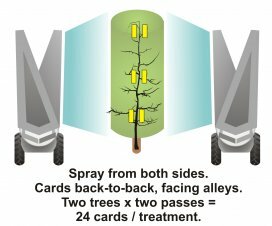 You can choose to overspray treated areas again at a lower dose (label permitting), or use a hedgerow or target row that has been set aside for this purpose. Do this two more times. 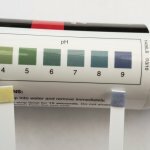 The discharge should be clear – not cloudy. Now bring the sprayer back to the mixing/loading area to finish the cleaning process. 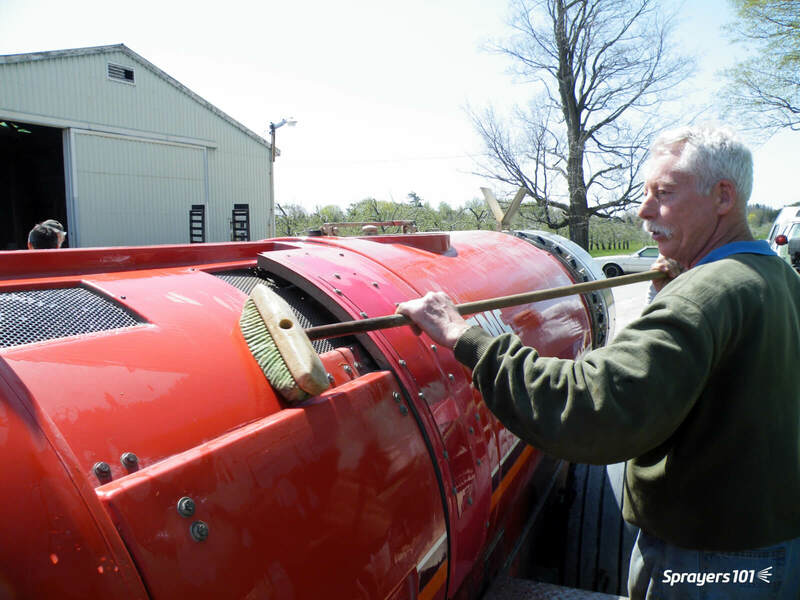 Ideally, the sprayer should be cleaned in rotating locations to prevent residue buildup. 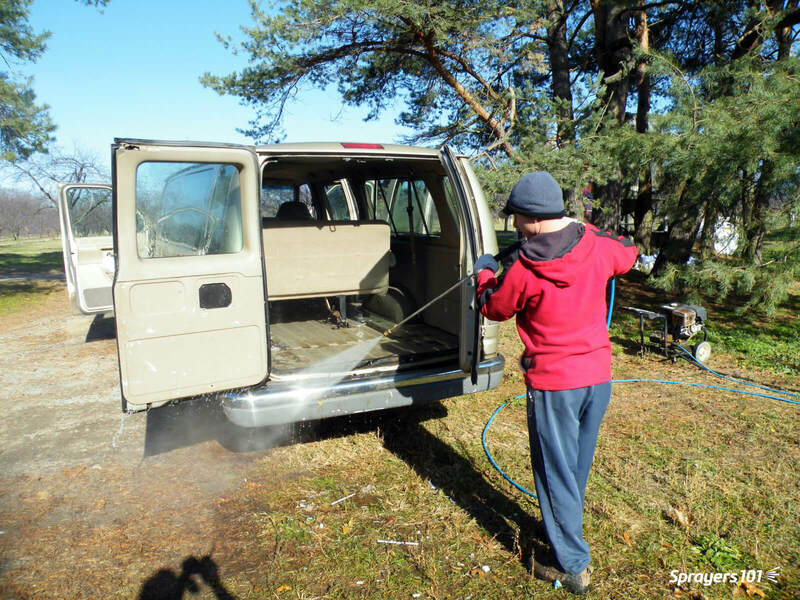 If cleaning in the farmyard, precautions must be taken to ensure washing is performed away from wells or open water and any washings are secured. This isn’t always realistic. 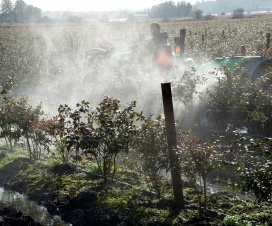 Most often, operators wash the sprayers in the same location on crushed gravel far from sources of water. We’ll assume, for the sake of a good night’s sleep, that the next steps take place on a permanent loading/mixing pad. Keeping the sprayer clean, inside and out, as part of the spray day. K. Bell is pictured giving his FMC a bath. This picture was staged – he normally wears PPE and so should you. Use a bucket of water and a brush (e.g. an old toothbrush), and remove, inspect and clean the suction and in-line screens. Remove, inspect and clean the nozzle strainers and nozzle tips, too. Hose down and clean the exterior of the sprayer. Scrubbing with a push broom works well. Replace all the parts and you’re done! Fill the tank about 1/2 full of water and add tank cleaning adjuvants like ammonia at 3%/100L water (this raises the pH and helps remove those products whose solubility benefits from this) and detergent at 1.0 kg /150 L water (this removes the oily layer formed by EC formulations). Commercial cleaners like All Clear or Cleanout conveniently combine these properties in one jug. Be aware that adding a surfactant or a commercial cleaner can generate a lot of foam, so have de-foamer handy. Use a bucket of cleaner solution from the tank and a brush (e.g. an old toothbrush), and remove, inspect and clean the suction and in-line screens. Remove, inspect and clean the nozzle strainers and nozzle tips, too. Meanwhile, agitate and circulate it through the entire sprayer for five to 10 minutes. Open and close any lines or valves during this process to ensure everything is exposed to the rinse. You might spray a small volume through the booms, but drain the vast majority through the plumbing system. Collect some for cleaning the exterior of the sprayer. 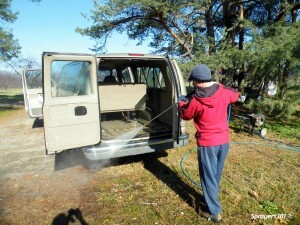 Clean the exterior of the sprayer. Scrubbing with a push broom works well. Rinse it all off, replace all the parts and you’re done! 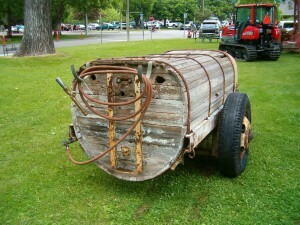 Pressure washers are handy tools on a farm, and they’re fun to use, too. However, they can cause a great deal of damage if they are used to wash delicate things like engine parts, electronics housings, or sealed bearings. Use caution! 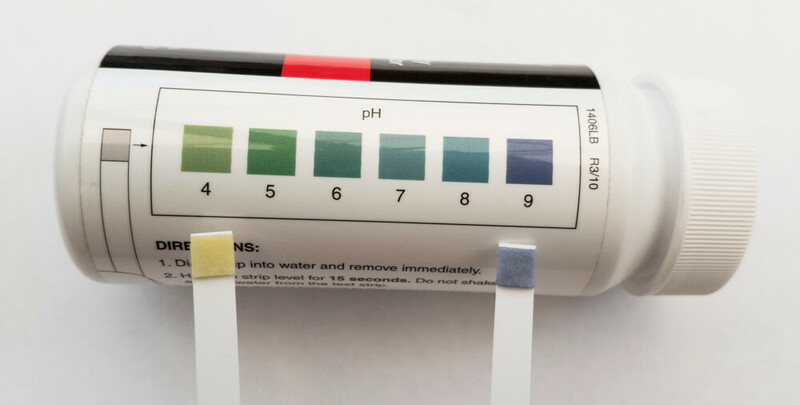 Remember, ammonia cleaner products do not “neutralize” pesticides; they raise the pH, improving the solubility of some products. Do not use chlorine bleach! It is not as effective a cleaner as ammonia and can form chlorine gas when mixed with ammonia-containing liquids. Store nozzles and strainers in a safe, dry place. With the agitation on, circulate undiluted plumbing antifreeze (the sprayer already has 5-10 L of water in the system from the decontamination process) for five minutes and drain it through the plumbing system (not the booms). If required, drain and flush crankcase and refill with new oil. Take this opportunity to touch up the paint. Leave the valves open, and the tank lid loose. 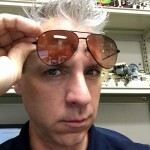 Protect plastic parts from sunlight. Non-corrosive liquids can be left in the pump and air must be kept out. Plug the ports or seal port connections. In the case of conflicting instructions, always defer to the manufacturer’s instructions for winterizing the sprayer. This is also an excellent opportunity to perform annual wheel bearing maintenance.